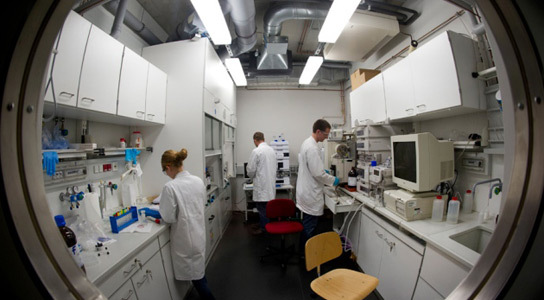 According to the results of the first international survey of researchers’ workplace attitudes and practices, scientists may have a false sense of security about the safety of their laboratories. 86% of the 2,400 scientists who responded to the survey stated that their labs are safe places to work. Yet just under half experienced injuries, ranging from animal bites to chemical inhalation. A large part of the scientists also noted frequently working alone, unreported injuries and insufficient safety training. Nature Publishing Group and the firm BioRAFT helped launch the survey. UCLA’s Center for Laboratory Safety plans to analyze the data more closely later this year. Most of the participants were from the USA and the UK, but also came from Europe, China and Japan. They felt that any injuries sustained were part of the job. The most common injuries were minor, but 30% of the respondents said they had witnessed at least one major lab injury, which required the attention of a medical professional. More than one-quarter of junior researchers stated that they had experienced an injury that they didn’t report to their supervisors. Only 60% said that they had received safety training. Around half agreed that lab safety could be improved, with chemists (60%) most likely to feel this, and neuroscientists (30%) significantly less so. Around 40% of junior scientists said that people worked alone in their lab every day, compounding the risk to health in the case of an accident, compared to only 26% of senior scientists. Junior researchers tend to work longer hours in the lab than their bosses. Half of the juniors worked over 40 hours a week, compared to just one-fifth of seniors. UK and US scientists also assess lab risks differently when they start an experiment, due to legal requirement. Two-thirds of Britons said they used their organization’s approved form of risk assessment, which is mandated by the UK Health & Safety Executive. Only one-quarter of Americans did the same. Researchers tend to have mixed feelings about safety training, inspections, and safety rules. Two-thirds thought that lab inspections improved safety, with senior scientists more likely to agree than juniors. Some health and safety experts think that the survey was too broad and unfocused to draw definite conclusions. The non-randomized sampling technique was also criticized. Be the first to comment on "Laboratory Safety Concerns: Researchers Aren’t As Safe As They Feel"